I had read on the eczema forums at skincell.com that bathing in seawater is very good for eczema prone skin. This got me thinking. As a kid I had always had a regular 2-week beach holidays in Majorca every year. Apart from the odd one, I haven't really had many since and I'm wondering whether those sun and sea soaked holidays helped to keep my eczema in check? Who knows! 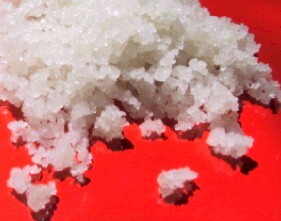 Anyway, it was mentioned that you could get similar benefits from having baths with Dead Sea Salts (I've heard in the past that these are very beneficial for dry skin) and that normal sea salt crystals are also good. On the site it gave a recipe for a bath using only natural ingredients, and as I was off to Tesco that day I thought I'd pick everything up and give it a go. The only ingredient I was wary about was the apple cider vinegar so I tested it neat on a patch of dry skin before getting in the bath and had no reaction. Oats are meant to be very good for dry skin too (hence why they are used in Aveeno moistursing cream). The bath felt very nice but I must confess that I had it hotter than I should have :( The red patch on my face did not flare up and the skin felt quite smooth there but all the other patches went very red. I think this is more due to the hot water than the ingredients. I often read about the benefits of various soothing baths on eczema, such as Balneum and Oilatum, but if you can only have the water cool/ barely warm I'm not sure I can do it! Having a cool shower is one thing (it's actually quite bracing in the morning once you get used to it) but I really find it hard to cope with sitting shivering a cool bath. Urgh! When my skin is better ('when' not 'if' she says hopefully) I might try this bath again, or at least a sea salt bath, as a means of keeping my skin in good condition. I just need to get to the good condition bit first. Sometimes I get this different kind of eczema over my neck and arms/shoulders and find that a home made sugar scrub of sugar and coconut oil can help take the dry skin off - it sounds absurd but really can help. I always feel I have to remove the dry skin for the healing to happen do you? My back and shoulders do get very dry. Sometimes when I pull my clothes off it's like a snowstorm! (Gross, lol) Anything exfoliating tends to aggravate the eczema though. But you're right, basically my skin goes through this cycle of 1) gets irritated, 2) gets quite rough and inflamed, 3) eventually flakes off, 4)smooth skin underneath! but then 5) repeat :( I jut need to stop step 1 from happening again. If only I knew how!